It's December, when the days get shorter and colder. 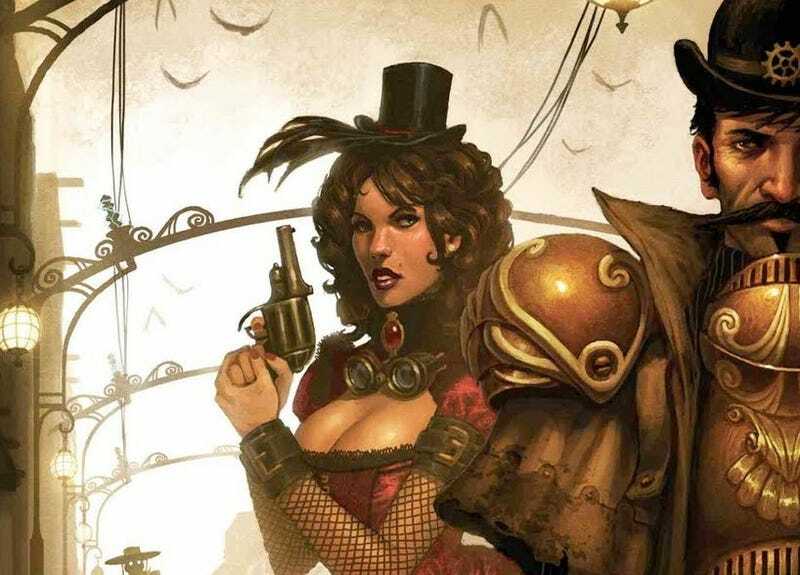 But there's no frigate like a book, and this month your ship's come in: The month's new books include cut-throat tailors, steampunk Wyatt Earp, and zombie Star Wars. It's been all too clear since high school: Our near-future dystopic overlords won't be totalitarian double-talkers or far-right demagogues. Nope, it's the excruciatingly hip and fashionable. Or so posits Yarn, Jon Armstrong's stand-alone prequel to his well-received debut Grey. "Saleswarriors" fight it out for customers in places like Seattlehama, while the unwashed masses, on the other hand, toil in agricultural slums. And designer Tane Cedar is forced to grapple with this stark divide when his ex stumbles back into his life, begging him to ease her pain with a coat made from an illegal psychedelic yarn. Looking to fill the corpse-sized hole in your life left by The Walking Dead's truncated season? Well, look no further. Twenty writers contributed to this anthology, but it's not a disparate round-up of stories. Instead, it's structured as a collection of real documents, providing multiple perspectives on the end of the world. Philosopher, alchemist, charmer, and known liar Saloninus opens his own history by announcing he's discovered how to transmute metal into gold and murdered his wife and patron's sister, Eudoxia. He proceeds to relate his story of a life unburdened by morality or virtue, detailing his attempts to elude the law and the wrath of his patron, Prince Phocas of Paraprosdocia. If Geronimo had only been armed with magic, the United States never would have made it past the Mississippi. That's the premise of five-time Hugo-winner Mike Resnick's latest. The federal government sends Thomas Edison west to figure out how to fight magic, and because they can't send a genius into the wilderness unprotected, they assign Wyatt Earp and Doc Holliday as his mechanical-armor-wearing bodyguards. (No word on what Tesla's up to. Hopefully in this universe, he's got a better lawyer.) But as it turns out, Geronimo has hired the Clanton gang, and you know what that means: steampunk gunfight at the OK Corral. Back in March, controversy erupted online (as it has been known to do) about this article, which leaps to the conclusion Judaism isn't a religion predisposed to fantasy. This anthology answers that ill-advised claim with ten years' worth of Jewish scifi and fantasy. Included are big names Michael Chabon, Neil Gaiman, Peter Beagle, and Jane Yolen. In the latest addition to her New Amsterdam series, Elizabeth Bear sends her immortal detective Don Sebastien de Ulloa to Moscow, accompanied by Lady Abigail Irene and Phoebe Smith. Theirs is an alternative timeline, one where the struggle between Britain and the Colonies occurred a century behind schedule and the fantastical is everyday. Sebastien is tired and grieving and just wants to recuperate—but the White City doesn't cooperate. What are you gonna do on New Year's Day when all you want to do is die, thanks to a monstrous hangover and embarrassment over that ill-advised midnight make-out? You could attempt to face the new year. Or you could stay in bed reading zombie Star Wars. Duh. Death Troopers author Joe Schreiber returns to the Star Wars universe with another novel featuring the undead - and this time, they're Sith. Anne McCaffrey and cats go together like dragons and telepathy. So naturally, she's teamed up with long-time collaborator Elizabeth Ann Scarborough to produce another novel about her barque cats (which the connoisseur may recognize from The Rowen). The shady-but-magnetic Pshaw-Ra plots to wrest control of the universe from humanity and let the cats rule, and his only opposition appears to be the feline Chester and the human Jubal. This month, super-anthologizers George R.R. Martin and Gardner Dozois honor Jack Vance. But rather than merely serving up stories in his style or touching on his favorite themes, 23 contributors have written stories set in Vance's "Dying Earth." Included are pieces by Martin, Neil Gaiman, Dan Simmons, Tad Williams, and Kage Baker, plus an introduction by Dean Koontz.